Several days ago, I started a series of rumor posts on my personal Google+ account discussing some Android rumors I felt were interesting enough to share, but didn't feel confident enough yet to do so here on the site. The posts were heavily prefixed with disclaimers that none of them may turn out to be true but that I had a certain level of confidence to talk about them in public unofficially. After posting rumor #3 (the one that everyone got seriously excited about), I was able to get a second confirmation and now have enough confidence to promote it from Google+ to Android Police. We do not have possession of any APKs or unreleased devices, so please don't ask for them. Based on everything I've seen so far, I'm assigning this rumor a score of 9 out of 10. I'm docking a point due to the lack of the release timeline. As far as rumors go, it's almost a sure thing. 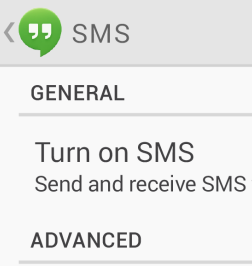 Hangouts, which has so far only successfully unified Google+ Messenger and Google Talk, leaving Messaging and Voice to co-exist, is finally getting SMS and MMS integration. According to sources familiar with the matter, the upcoming Hangouts version 1.3 has these features enabled and, furthermore, also allows sharing of videos via the Hangouts protocol. 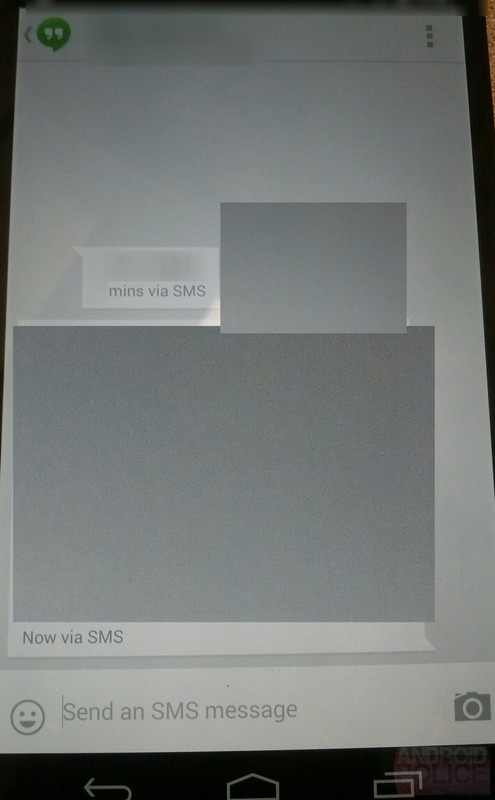 Messages sent via SMS will show "via SMS" next to the timestamp so that you can always figure out the protocol used for each message delivery. 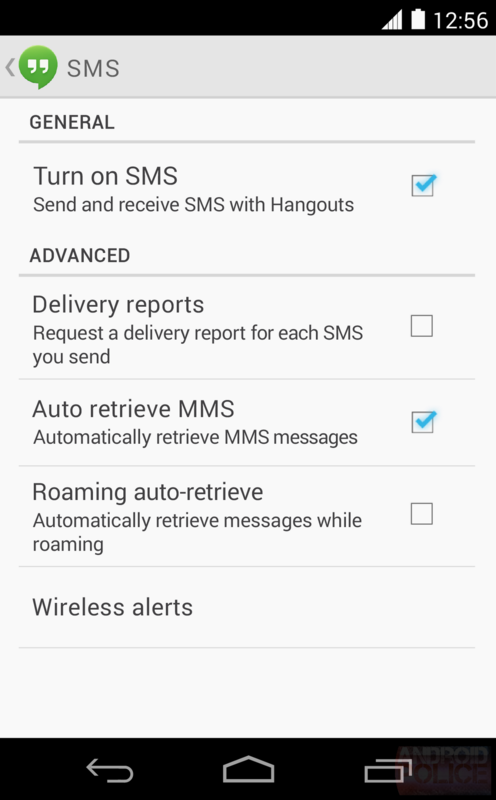 You can request delivery reports for sent SMSes - a feature that is part of the SMS protocol that some of you may be using regularly (though if you are, please don't text me Update: I was actually thinking read receipts, which are apparently different from delivery confirmations and don't bug the recipient). MMS picture messaging is supported as well, though I can't confirm sending of video via MMS at this time. There is a settings menu for wireless alerts as well as a toggle for auto-retrieving messages while roaming. 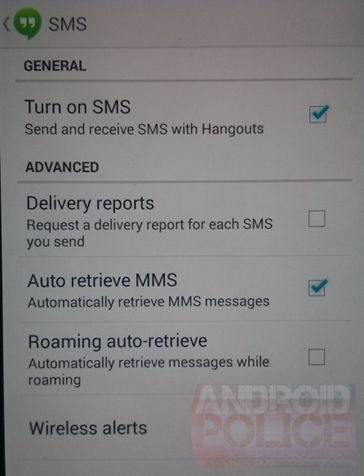 Finally, you can opt out of SMS via Hangouts altogether. Originally, I suggested that the stock Messaging app may be going away in favor of Hangouts, at least on Nexus devices. I am unable to confirm it at this time and won't be able to until we see final KitKat software. 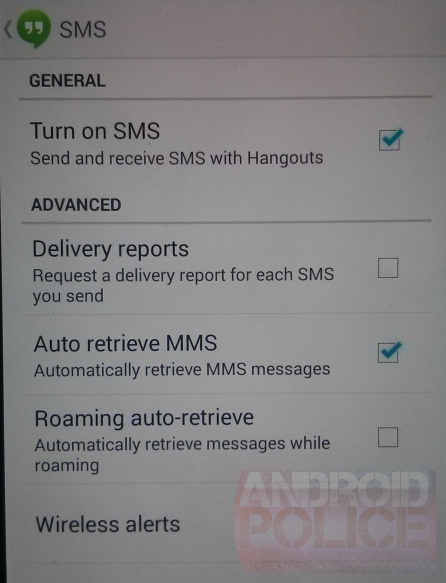 However, if I were to speculate, I would suggest that the Messaging app will remain in AOSP, but Nexus devices will skip it and ship with just Hangouts pre-installed. Once again, this part is speculation on my part. Update 10/11/13: A confirmation from TuttoAndroid, which fully matches this rumor and suggests once again that Messaging is a goner. I have no information at this point about a possible release timeline and correlation between KitKat and this Hangouts update. It's possible that Google will roll it out before KitKat but it's equally as possible for it to come out later if it's not fully baked just yet. Today, we were able to obtain some pretty compelling evidence, seen above, but we may not be able to post screenshots or photos for every future rumor. Two down, one to go. Baby steps.